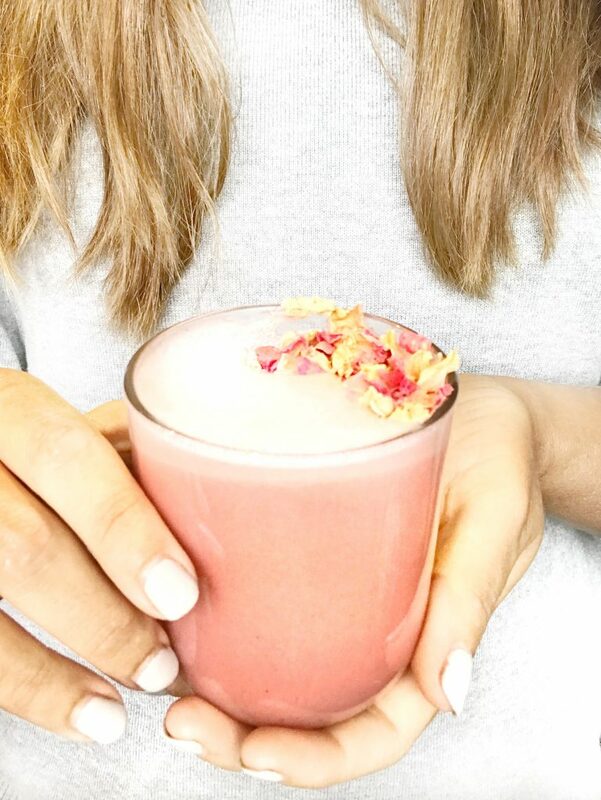 Say hello to the prettiest drink on the planet…the rose latte! This week I’m sharing my rose latte recipe, so you can recreate one of my favourite beverages and enjoy your own caffeine-free, healthy hot drink that looks beautiful, tastes delightful and is really good for you! The secret ingredient in this rose latte recipe is beetroot powder. It has a beautifully subtle, earthy flavour as well as a vibrant pink colour. It’s the perfect drink to settle down with mid-afternoon and is an amazing accompaniment to a healthy sweet treat like a raspberry raw brownie or a rose raw chocolate. 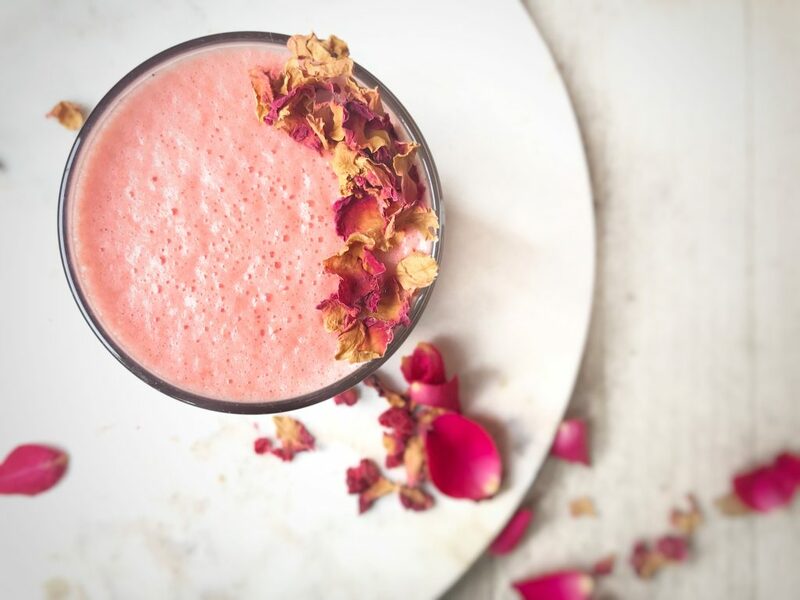 I’m going to be serving mugs of petal strewn rose lattes on our upcoming Cornwall retreats and can’t wait to wow the retreat yogis with how sweet and scrumptious they are. Place a small saucepan on a medium heat and warm your almond milk. When it is hot but not yet boiling whisk in all the other ingredients except for the dried rose petals. Pour in to a mug or glass (or see my recipe note below) and decorate with dried rose petals and freeze dried raspberries. 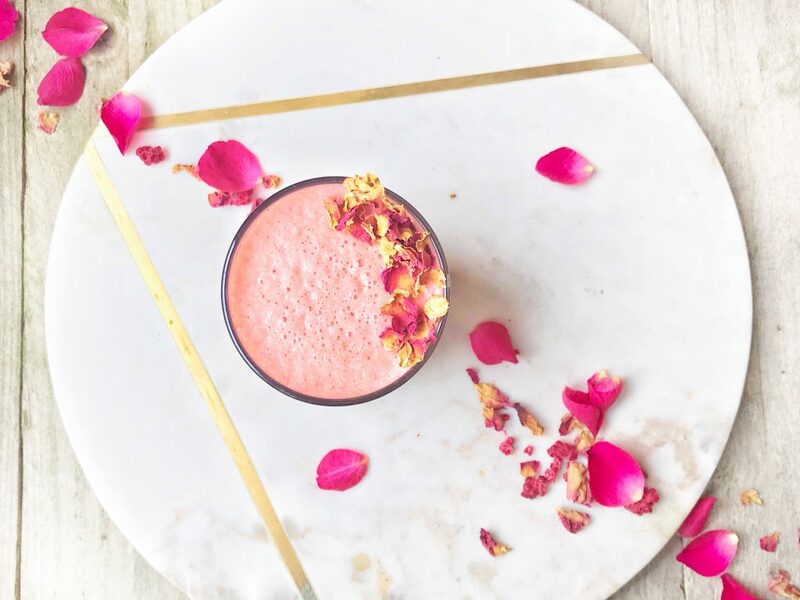 If you liked this rose latte recipe click here to get weekly health and well being inspiration, online yoga classes, recipes and more delivered direct to your inbox! If you have a nutribullet or similar blender put your warm milk and other ingredients (except for the dried rose petals & raspberries) in it and blend it. You’ll end up with a really frothy mix when you pour it out in to a cup. Try it – it’s amazing! Sprinkling your latte with rose petals and dried raspberries will make it look stunning, and the finished result always makes me smile, but you can leave this off and still enjoy the latte. I use Rude Health almond milk for my latte, and it’s natural sweetness means I don’t need to add any additional sweetener. If you use a different brand you may want to add a teaspoon of maple syrup or sweeter of your choice.